The Vienna Café chair No. 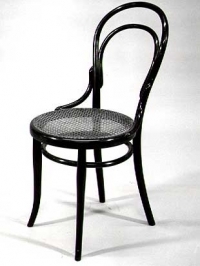 14 is probably the most successful example of Thonet bentwood furniture. Certainly it is the most simple and prolific. It was produced starting in 1859, as a "chair for mass consumption," and by 1930, more than 50 million had been produced. It is assembled from six pieces of wood held together with screws and nuts, with a caned seat. Gebruder Thonet, the Austrian company founded in 1853 by German cabinet maker Michael Thonet (1796-1871) and his five sons, had 52 factories in Europe by 1900, making bentwood furniture. Other models of that era include the Rocking Chair # 10, produced since 1866, and a senuous reclining couch, Model No. 2, produced since 1885. All were designed by Michael Thonet. The Vienna Café chair No. 14 achieved a permanent place in modern design history when it was included in an innovative housing exhibit called L'Esprit Nouveau at the Paris Exposition Internationale in 1925. Virtually un-noticed at the time, the exhibit, designed by French architect Le Corbusier (1887-1965--born as Charles Edouard Jeanneret Gris ) and his cousin Pierre Jeanneret (1896-1967), was an essentially bare and undecorated home interior, with metal file cabinets, bistro wine glasses, laboratory flasks as vases, industrial equipment, and commercial furniture (the Thonet chair) as part of the "decor". It was In fact, it expressed a complete rejection of decorative art, but within five years would greatly influence the direction of the modern movement, because of its emphasis on making the home a more efficient place, rather than the soon-to-be outdated emphasis on stylistic decor. Michael Thonet opened his furniture cabinetry workshop in 1819 in a rural Austrian town. By 1835, he was experimenting with a then-new technology of bending solid wood into chair parts, and by 1841, had patented his unique technique, characterized by flowing forms and the resultant lightweight product. The same year, he exhibited in a Koblenz trade show, resulting in an opportunity to take his workshop to the capital,Vienna. Vienna Café society provided an attractive market for side chairs, and Thonet began a series of such designs starting in 1857. He had already transferred the business, in 1853, to his five sons: Franz, Michael, August, Josef and Jacob. His patents for the process expired in 1869, and imitations abounded. Thonet opened a London office in 1862 and a New York office in 1873. Starting in 1900, Thonet became very involved with the Art Nouveau movement, collaborating with architects and designers in the production of innovative designs. Gebrüder Thonet was in business until 1922, when it was absorbed into a corporate empire, the Thonet-Mundus holding company, headed by Leopold Pilzer (1871-1959), with over 10,000 workers and 20 production sites. In 1938, Leopold Pilzer, head of Thonet-Mundus, emigrated to the US, purchased three US furniture companies as subsidiaries, and established Thonet Industries, Inc. with headquarters in New York. After the war, Thonet relied on its in-house staff and followed a conservative business pattern in contract furniture. Thonet Industries celebrated its one-hundred year anniversary at a 1953 exhibition by the Museum of Modern Art, and in 1962, became a subsidiary of the Simmons Company. In 1973, under new president James Riddering, Thonet Industries move to York, PA and converted from an in-house design system to an independent design program. In 1975, it launched a New Design Program directed by Joan M. Burgasser, engaging designers such as Don Petit, Warren Snodgrass, and David Rowland. In 1979, Thonet and its parent company, Simmons, were acquired by Gulf & Western, and in 1987, Thonet assets, including an historical collection of 200 pieces, were sold to Shelby Williams Industries, Inc. In 1993, Mr. Manfred Steinfeld, a former Chairman of that firm, lent this collection for an exhibition at the Art Institute of Chicago that year, which published Against the Grain, a photographic history of bentwood furniture, concurrent with the exhibition.